Geographically, Australia has a lot in common with the Sahara. They are about the same distance from the equator, the Sahara to the north and Australia to the south, and the northern section of Africa is a little wider west to east. Both regions are dominated by deserts with very little water. The major difference in climate is simply stated. 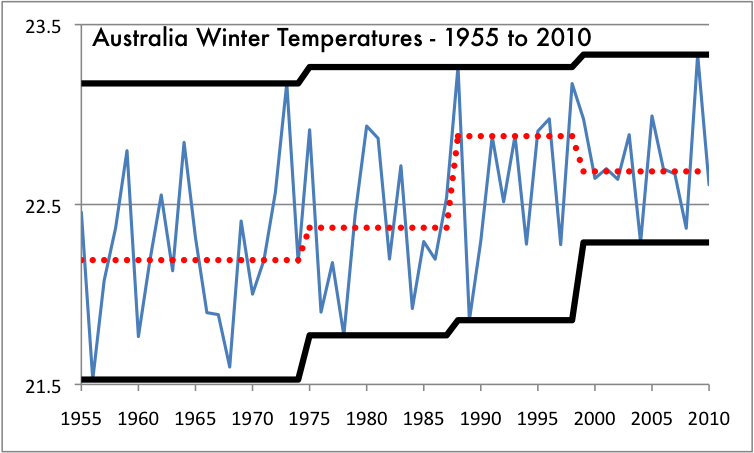 Australia is not warming as quickly or as convincingly as the Sahara. 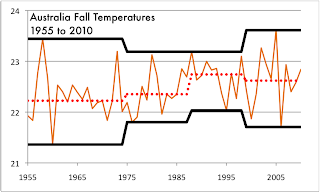 Less than half a degree Celsius in 56 years is not particularly alarming, not like the 1.08° C change seen in the Sahara. 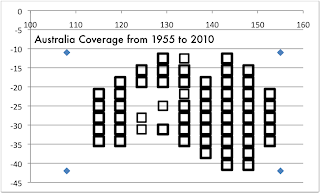 The grid coverage of Australia from 1955 to 2010 has a few points in the west without any coverage, but ignoring those few glitches, the shape of the grid closely matches the shape of the country. 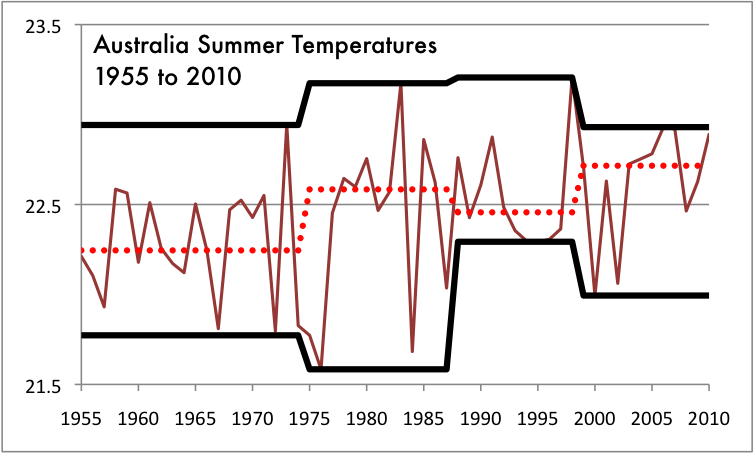 Since Australia is south of the equator, we begin the year with the Summer temperatures. In every one of our measuring systems (also called metrics), the numbers bounce around. 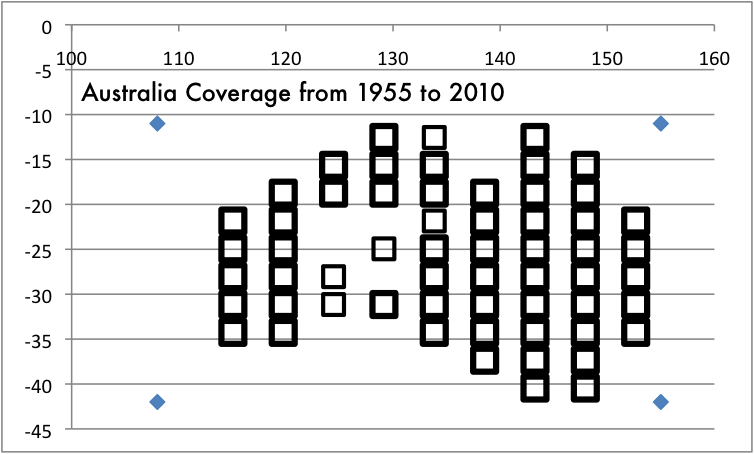 Because I distrust cherry picking, I look first at the median of our time periods, marked in the dotted bright red line, and there we see an increase from the first era (1955-1977) to the last (1999-2010). 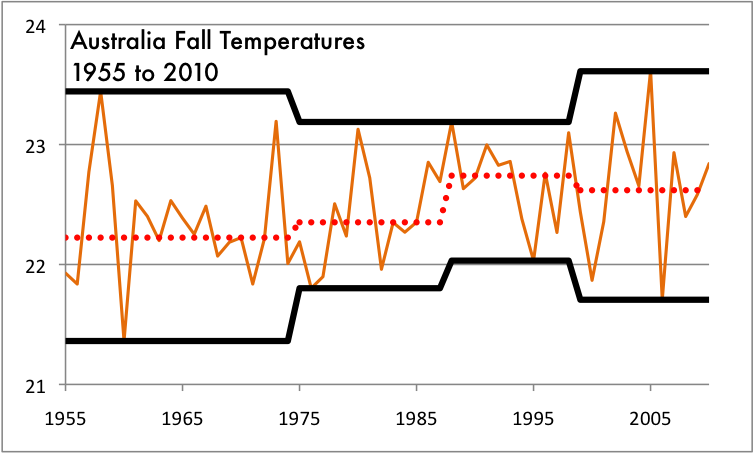 Change in 1955-1975 median to 1999-2010 median: 0.4705° C.
The changes in the Fall numbers also look generally random, but the median does show an increase, also less than a half degree. 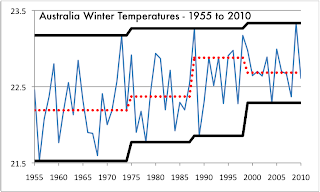 Change in 1955-1975 median to 1999-2010 median: 0.395° C.
The Winter variations show a step increase function in the record highs and lows, but the median took a step down between the 1988-1999 era and the most recent one. 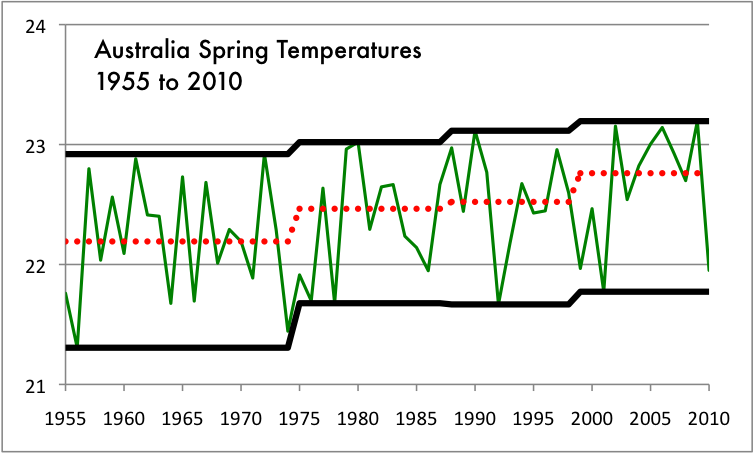 Change in 1955-1975 median to 1999-2010 median: 0.493° C.
Spring show slow but steady increase in nearly every metric across the board. 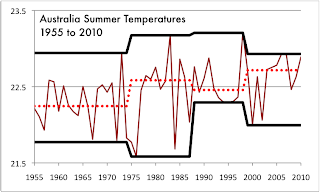 Change in 1955-1975 median to 1999-2010 median: 0.569° C.
Average seasonal change in the medians of 1955-1975 to 1999-2010: 0.48° C.
While the Sahara and Australia have geographical traits in common, the climates are moving in very different ways. 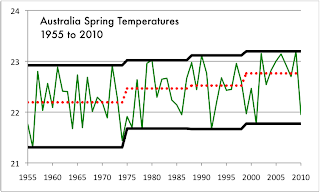 Australia is warming, but not by alarming amounts and we have no confidence the rate is increasing and a very tepid confidence the rate is decreasing. It would be nice if there was a reasoned discussion of the data, but the current climate of discussion makes that seem impossible.